A customer needed to read some simple information out of our server software programmatically, and suggested that a "SOAP API" might be a good way to do that. To me fell the task of researching what that might mean. SOAP is a lightweight protocol intended for exchanging structured information in a decentralized, distributed environment. Why, it says so right in the spec! I dread to think of a protocol that the W3C would call "heavyweight". I write to thank you for writing Relativity: Special, General and Cosmological. I picked it up by chance at a university bookstore several years ago, and I've found it to be very enlightening and well readable. I'm what one might call a physics amateur – not quite a physics student, certainly nothing resembling a researcher, but possibly a step up from the "educated layman" level. I like to extend my understanding of modern physics, for my own amusement and a sense of moral duty for a thinking being to at least try to understand the world he finds himself in. Here, by "understanding" I mean something deeper than memorizing some popularizer's free-floating qualitative assertions and analogies. Luckily, as a computer scientist with a B.S. in mathematics, I am no stranger to formulae – a mathematics-free understanding of any area of physics appears to be an oxymoron. It is not easy to find good literature for a project such as mine. There are, of course, many books that purport to explain modern physics to laymen, but they all studiously avoid presenting any mathematical content of the theories they speak of. (The only exception I have encountered is Roger Penrose's The Emperor's New Mind, which however covers so much ground that its treatment of any particular subject is very brief). Even when they manage correct qualitative descriptions of a theory, they cannot, lacking formulae, convey a good sense of the predictive character of the theory. As for general relativity, popular works tend to stop at the rubber-sheet analogy, usually without even developing it enough to make it clear whether they try to depict spatial curvature or graph gravitational potential. On the other hand, actual university textbooks tend to be too dry for the amateur. They often dive straight into formalism, with much time spent on methods of concrete calculation and little emphasis on intuition and perspective. The amateur (meaning I) tends to have little patience with problem-solving tricks; he wants to understand the structure of the theory more than he wants to apply it in practice (though, of course, one person's clever computational shortcut can become a basic feature of another's theory – as I understand it to have been the case for quantum electrodynamics). And above all, he needs hints about intuition and perspective. Intuition without mathematics is for cocktail-party philosophers, but mathematics without intuition is for robots. Apparently most textbook authors rely on the instructor for supplying students with the big picture, which is not unreasonable but does not help for self-study. Your book, however, is a rare gem: A text that both teaches the formalism of the theory and explains what it means intuitively. In reading some of the sections, I have followed the mathematics carefully, checking derivations and doing exercises. This gives me a solid sense of knowing what goes on. In other sections I have skipped most details of the formulae but still got a general picture from the connecting text. This general picture is, in a sense, second-hand knowledge, but feels more secure than that, because the mathematical details are right there should I ever want to check them. It is very wonderful that the book is capable of being read both ways. I'm convinced that this book has made me smarter. It has enabled me, in many discussions with fellow amateurs, to correct (I hope!) misconceptions and confusions caused by fuzzy and imprecise popularizations of GR and black holes. I have been recommending it left and right. I'm very happy that it exists, and that I discovered it. Respectfully recommended for your reading pleasure: Relativity: Special, General and Cosmological by Wolfgang Rindler (Oxford University Press, 2001; 2nd ed. 2006). This book will teach you everything you want to know about special relativity (saw the Lorentz transform in high school and thought it was all there is to it? Think again), general relativity, black holes, as well as a fair overview of cosmology and tensor calculus. The preface promises: "Anyone who knows the calculus up to partial differentiation, ordinary vectors to the point of differentiating them, and the most useful method of approximation, the binomial theorem, should be able to read this book." As far as I can tell, that is what it delivers. Some time ago I confessed that I read American court documents for fun. I cited the quality of some judges' writing as a reason for that, but a side benefit is some indirect insights into the half-continent of madness that is the United States of America. And sometimes, by contrast, into little old Denmark too. Consider this recent case, Gonzalez v. Aurora. Several people from a western suburb of Chicago sued their city council, demanding that its voting districts be revised such that their particular racial group would be likely to get more seats on the council. Plaintiffs lost in the lower (district) court, and now they lost in the appeals court too. The court's opinion does not have the kind of dazzling rhetoric I wrote about earlier. But it made me think, about the differences and similarities between the political system it describes and the one I'm used to. It probably ought to startle me that this matter is considered something that a court should decide at all, but it doesn't. In USA, it seems, everything is a potential matter for court intervention. Everyone who doesn't live in a cave probably heard about the 2000 presidential election. What does trouble me a bit is that the plaintiffs' argument seems to assume that the voters in Aurora decide who to vote for using candidates' race as their first and final criterion. Such voter behavior is not unheard-of – in semi-failed post-colonial states suffused with mutual distrust between clans and ethnicities who find themselves sharing political structures by way of historical accident rather than sharing a functional society. But in a modern democracy with everybody integrated in a common economy? I know that when I go to vote, I try to vote for the candidate who shares my political views the most, rather than one who shares my complexion. It might seem equally troubling that the appeals court willingly accepts this strange theory. But the court did find against the plaintiffs, and it makes for a stronger and more persuasive opinion if the court goes along with the losing party for the sake of the argument until the critical point where the loser's case breaks down. Implicitly, the court says "even if you were right about all this, you'd still lose because so-and-so". But what really got me thinking was the unquestioned baseline assumption that most councilmen have to be elected in single-seat wards. Voters who happen to agree with the majority in their local ward get to be represented. Voters who are in a local minority become virtually, or nearly, disenfranchised. It doesn't matter if some political stance has a uniform 49% following everywhere; it gets zero electees because its popular support is insufficiently clumped. I have heard people trying to justify such a system, but I've never been able to grasp their arguments. Why should geography matter? When I go to vote, I try to vote for the candidate who shares my political views the most, rather than one who by some quirk of the housing market happens to live close to me. This would be quaint and amusing if is was a specific rarity of Aurora, Illinois. But it is sad that it is actually quite common. Most famously, perhaps, with the electoral college by which Americans chose their president. It is not a particularly American phenomenon, though. The UK House of Commons works the same way. And the way we elect the European Commission is perhaps the most indirect, convoluted and opaque of all, closely followed by the Council of Ministers which has the final political say in all matters EU. Closer to home – in Denmark municipal councils are elected directly and proportionally, simple enough. But elections to our national parliament the Folketing, use a weird mix of geographic and proportional methods. Some members are elected in regional districts, with a number of additional at-large seats distributed afterwards such that the final party make-up of the parliament will get as proportional as possible. Then there are complex and elaborate rules for simultaneously distributing the at-large seats to ensure approximate geographical proportionality in the parliament as a body, as well as within each party. Active politicians care about this system, because it decides which among each party's candidates win a seat, a matter of paramount importance among those running. Almost nobody else does, and look only to the final party breakdown (which, being guaranteedly proportional, can be understood without resorting to geography). When I've been a poll worker at general elections, some voters were obviously confused because the political leader of their choice was not on the ballot – he or she were running in a different district. Again, why should geography matter here? A smart voter tries to vote for the candidate who shares his political views the most, not one who happens to live in the same part of the country. And, adding to the confusion, the district a candidate runs in does not have to be the district where he or she lives. In fact, for top politicians it is the exception more than the rule. Each party selects the running districts for its top candidates tactically, to maximize their chance of election given the above-mentioned rules that ostensibly exist to equalize the geographic origin of the MPs. Except that what it really equalizes is virtual pseudo-origins chosen solely based on the rules themselves. Excuse me, but I fail to see that society at large benefits at all from this convoluted system. (... now where was I? Something about a court and a city council in Illinois, I think. You mean I was supposed to have a point about that? Sorry. Still new to this blog thingie). 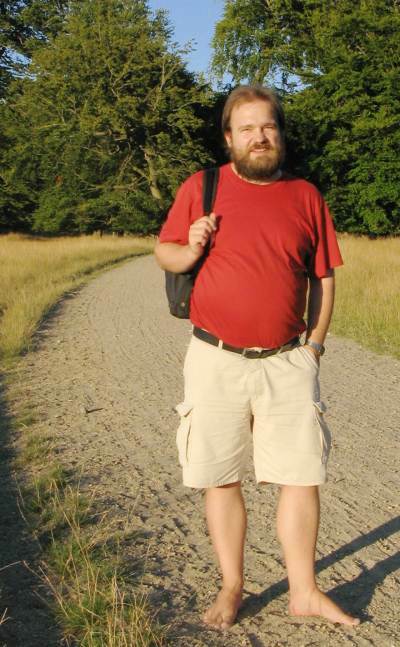 In 2003, after I completed my PhD dissertation in Copenhagen, I moved to Edinburgh to work as a post-doc for Joe Wells. Joe was rather eager to have me start as soon as possible such that I could receive a braindump from to the previous occupant of my position, who would be leaving soon. The plan ended up being that I'd complete and deliver the dissertation on Friday, and start work in Edinburgh the following Monday. I arrived on Monday with a suitcase containing several changes of clothes. Meanwhile, my parents were cleaning out my flat in Copenhagen, packing my stuff into boxes and having it shipped to Scotland. (Thanks, Mom and Dad – you're the best!) Note to self: such tight schedules can not be recommended for future job changes. The first thing I was told to do after I arrived was to go a bank and open an account into which my first salary could be deposited. Salary payments must be prepared some weeks in advance (paying out money always seems to involve red tape in proportion to the size of the organization), and I was arriving near the end of the month, so payroll needed an account number for me post haste. Otherwise they'd have to, I don't know, special-case my payment or something. That, apparently, would be a Bad Thing. The Royal Bank of Scotland had a branch right on campus. I went there and they created an "instant access savings account" for me. A few weeks later I discovered that this was not quite the type of account I wanted; I'd rather have a "current account". I don't remember what the difference was. Presumably I had good reasons for switching. For some reason, my existing account could not just have its type changed; I had to create a new account of the right type instead. Once I'd gotten the account number at payroll updated, I went to the bank and asked to have the savings account closed and its balance transferred to the current account. This happened. Except that the savings account turned out to be not quite closed. At the end of the year I received an account statement for it. 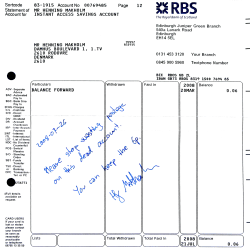 It had earned 6 pence of interest by containing half a month's salary for a few weeks, so its balance now read £0.06. There didn't seem to be any way to react to this that was worth the trouble, so I didn't. Time passed. Every so often, the monthly statement for my current account would be accompanied by another sheet reminding me that I had £0.06 in the savings account. In 2005 I moved back to Denmark. I had the current account closed (successfully) and its balance wired to my Danish bank. But that poor savings account kept sending me statements for the same £0.06 several times a year. Each statement probably cost the bank at least ten times the outstanding balance to print and mail. 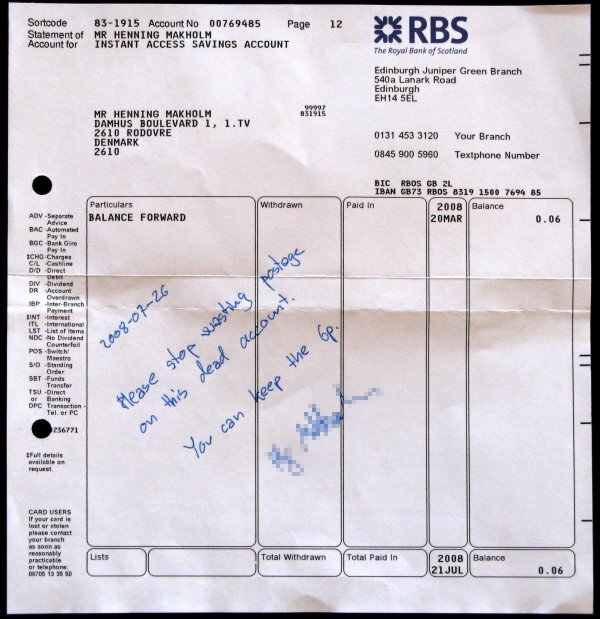 But I'd become less than satisfied with the Royal Bank of Scotland's service (for reasons that I may blog about later if I find myself in a particularly petty mood one evening). Anyhow, I figured that they deserved it, somehow. But perhaps three years is enough to forgive and move on. Today statement #12 arrived in the mail. I have just spent about a pound in stamps on returning it with a request to have it shut down. Ain't I a nice guy? 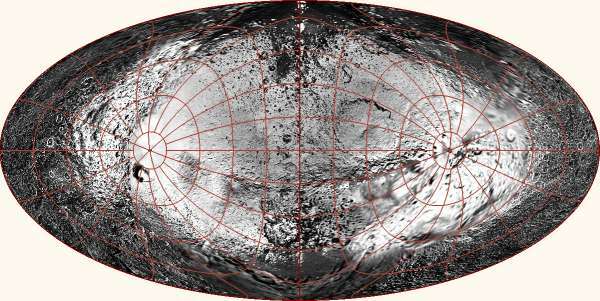 Now that I have a program to draw world maps with nonstandard orientations, I could not resist turning it loose on this albedo map of Saturn's moon Iapetus, pieced together from images taken by the Voyager 2 (1981) and Cassini (2005-2007) spacecraft. Iapetus is one of the strangest objects in the solar system. Its most famous feature is its "two-tone coloration": it has a light side and a dark side, and is much brighter when the light side faces the sun (and us). But there is more strangeness than that; go read the Wikipedia article. In the novel version of 2001: A Space Odyssey, Author C. Clarke explained away all the strangeness with a deus ex machina solution: the entire moon is an alien artifact! He warned, however that "the truth, as always, will be far stranger." 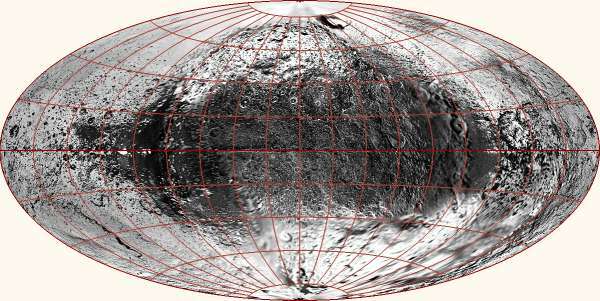 The edge of this map runs along the moon's equator, in the middle of Cassini Regio. Now we see a light splotch (called Roncevaux Terra) on a dark background. Magic! The boundary between light and dark does not really divide the moon into hemispheres; it goes more like the seam on a baseball. 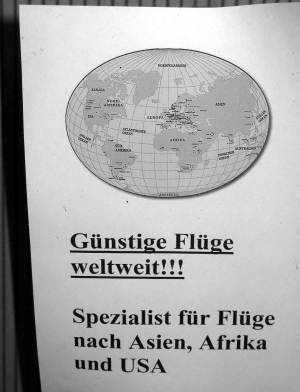 Here is a poster I saw in the storefront of a travel agency in Frankfurt. I don't know which projection this world map tries to be, but if that isn't a barrel-shaped world it depicts, you can call me a barrel. Since 2001, the home front of the questionably-named "War on Terror" has devolved into what Bruce Schneier calls the war on the unexpected, in which anybody doing anything out of the ordinary risks being hassled by authorities, on the theory that activity that the person-in-authority does not understand might somehow be part of a terrorist plot. A particular variant of this is the war on photography. It appears that in certain locales, photographing structures or buildings in public where the motives have no clear touristic interest, is considered particularly suspect. It makes a certain, tiny, bit of sense that a terrorist cell contemplating an attack might like to use photographs of the target and its surrounding in their planning. But it stretches my imagination to think that photographs would be such a sine qua non for a plan that banning photography would help much to prevent an attack by a determined group – at least when the photographs are of things that each would-be attacker could just walk up to and look at directly. I am pleased to report that the war on photography has apparently not reached Germany. I write this on the way home from a week's vacation in Frankfurt. My vacations are different from most because I have the rather weird hobby of collecting and understanding railway track layouts. There are quite a number of people who photograph, and otherwise obsess over, trains, but only few of us who lavish the same attention on the tracks the trains run on. In short, my idea of a good time is to go to a large station, hike out to the very ends of each of the platforms, taking lots of pictures of the surrounding trackage as I go. Then, if there are any public footbridges or streetbridges going over the track area, I go up on those and and repeat the exercise from there. Finally I take a train to another station, observing the neighboring tracks along the way, and either taking notes or photographing out the window. Repeat as long as daylight lasts. This probably does not sound like fun to you, but it works for me. When I get home I sometimes get time to process all of the photos and notes into nice track diagrams for the areas in question; you can see some of the finished products at my website trackmap.net. To get to the point, I've been doing this for a week – standing on the overgrown ends of platforms that are not being weeded because no trains stop that far out anyway, in plain sight of railway employees who didn't seem particularly busy (waiting for the train they are to work on), blatantly and obviously spying on their precious infrastructure. I even wear a terrorist beard. Yet, not once did anybody approach me to suggest that I shouldn't be doing what I did, or even to question what I was doing. This is the same experience I had for a week in Vienna in 2007, a few days in Glasgow in 2006, and a week in Berlin in 2002. (Not quite true; in Berlin a couple of good-natured Bundesgrenzschutz officers did ask me what I was drawing – this was before good digital cameras became affordable to me, so I was using binoculars and a sketchpad instead. But they seemed to be more curious than suspicious, and ended up wishing me a nice stay after I explained in halting German what I was doing. In retrospect, perhaps they were just checking whether I would act hinky upon being asked). The world isn't quite as bad a place as you would think reading about just the egregious blog-worthy extremes of the war-on-anything. Of course, that does not mean that the extremes don't deserve the publicity, ridicule and outrage they get. That is how we keep them from becoming the norm. But they are not yet normal, and that is a Good Thing. Actually, they may or may not be the norm in America. I have read too many scary war-on-anything blog stories to dare go there and find out. We all know that the Earth is spherical (not exactly, byt close enough for my purposes here). 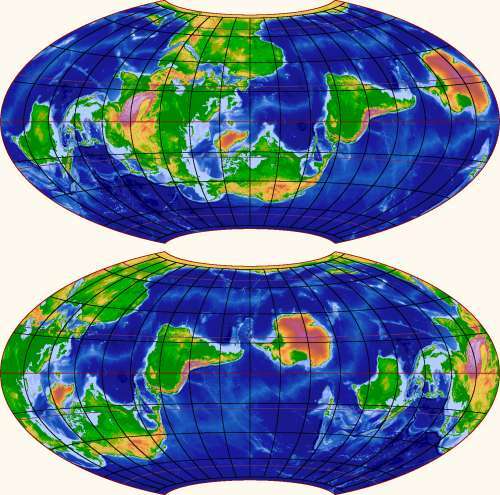 But what world maps seem to tell us is that is more like a cylinder. Wider at the equator, though – barrel-shaped perhaps? So we're familiar with the fact that if we keep moving east or west long enough, eventually we'll end back where we started. This striking enough that circumnavigating the globe is considered something in and of itself (Phileas Fogg never ventured south of the Equator, but is nevertheless considered to have gone around the world). But it does not feel strange, as such. The poles, however, are weird. 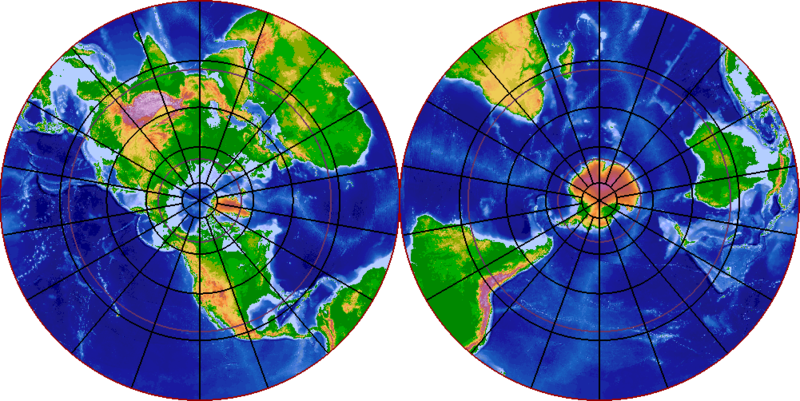 In the projection I have chosen here, each pole has been deformed from a point into a curve that forms the entire top or bottom edge of the map. We know, intellectually, that this is just a coordinate singularity, an artifact of the map projection. To someone actually standing on the pole, the ground will appear just as flat and featureless as it does anywhere else, modulo mountain ranges and other minor details. But knowing is not the same as really believing. We feel vaguely – or perhaps I should stop speaking for everyone else at this point – I feel vaguely that this coordinate weirdness somehow must correspond to a real weirdness, that if I were to go there I would somehow distort along with the map, like the proverbial gedankenastronaut who falls into a black hole and finds himself stretched by infinite tides in the east-west direction. A more everyday symptom of barrel-shaped thinking is the surprise we've all felt at some point noticing just how close to the pole a great-circle route between two distant cities goes. If you fly from London to Tokyo, the standard maps invite the assumption that you should head to the east and slightly south. But actually you should start out in a northeastern direction and pass quite close by Helsinki. This helps a bit, but not by much. The coordinate lines of the polar map still implicitly convey the message that the pole is a very special place. There's still a feeling that it has some momentous topological significance whether a path from point A to point B passes left or right of the the pole. Perhaps I just lack imagination, but I still find myself thinking in barrels when I look at a pole-centered map. Map globes are not much better; they tend have bearings and other special decorations at the poles which fuel the barrel fallacy directly. Stronger measures are needed here. The trouble seem to be the map grid – how about we draw a completely different grid over the polar regions? 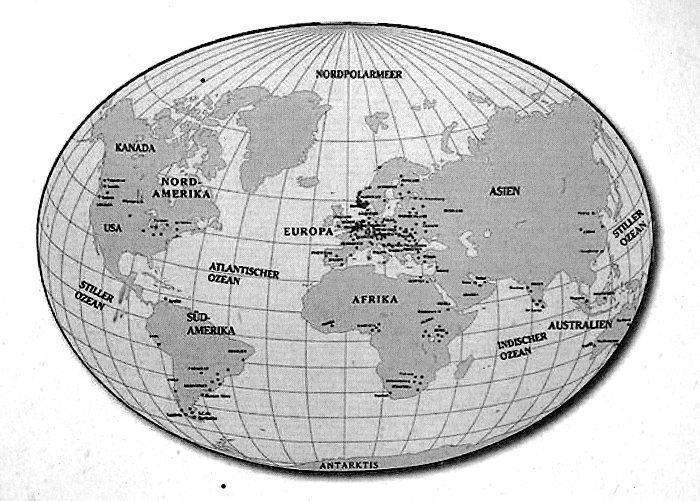 We could pretend that the Earth's axis passed through, say, Hawaii, and draw the world map that would result. The antipode to Hawaii proves to be in southern Africa, so that is where the other pole goes. The shape of Africa gets strangely distorted by the map projection, which should teach us to doubt what normal world maps tell us about the polar areas. The other continents look more recognizable, except – wonder of wonders! – the Arctic Sea is now clearly just another place. The fascinating part comes from wondering: If the world was actually tilted to turn around the Hawaii axis (but otherwise with its current orbit and axial tilt), which climate would such a world have? Latitudes give a crude hint at the weather at different places, but that is far from the whole story. Sea currents transport large amounts of heat around the globe, and the currents would be vastly different on the tilted globe, driven as they are by winds and Coriolis forces. The winds themselves would be different; winds try to align more or less with latitudes but are deflected by mountain ranges and warped by differences in sea temperatures (which are themselves governed by currents, which are driven by winds, making the whole thing recursive). I cannot even start to answer the climate question, but I'm sure a good answer would be very interesting. After climate comes culture. How would world history have unfolded on the tilted globe? For example, this world does not seem to need a Columbus. What, if anything, would that change? Would the Industrial Revolution still happen in a tropical, upside-down Britain? I suspect there's some pretty cool alternative-history fiction waiting to be written here. Note here in particular that the only "wet" passage through the edge of the map is the Bering Strait (save for the wiggliness of the Panama isthmus, which the straight edge cannot quite follow). This map tries to tell you that all of the oceans are really just a single sea surrounded by land. 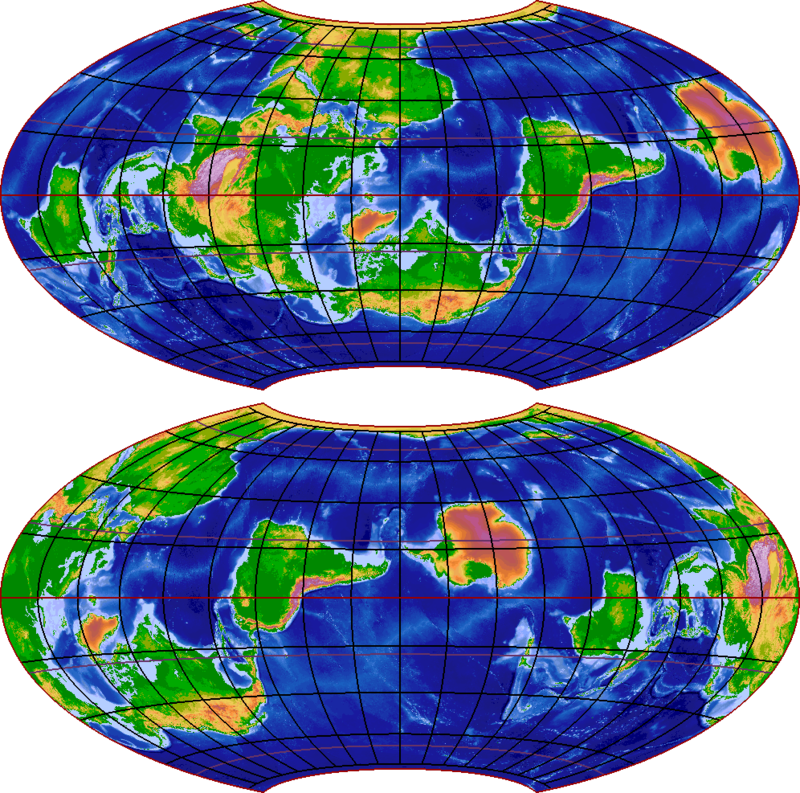 The previous two ones try to tell you that the continents are really just a group of islands on a water planet. 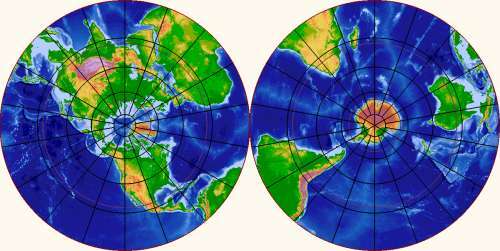 Both, however, show the same planet. We shouldn't believe any single map too much. P.S. I got the shapes of continents, with elevations and sea depths as a bonus, from the ETOPO2v2 dataset, which is a marvelous resource. My only regret is that I can't drain away the icecaps of Antarctica and Greenland, but it's not obvious how to define the result of that. And it is free! 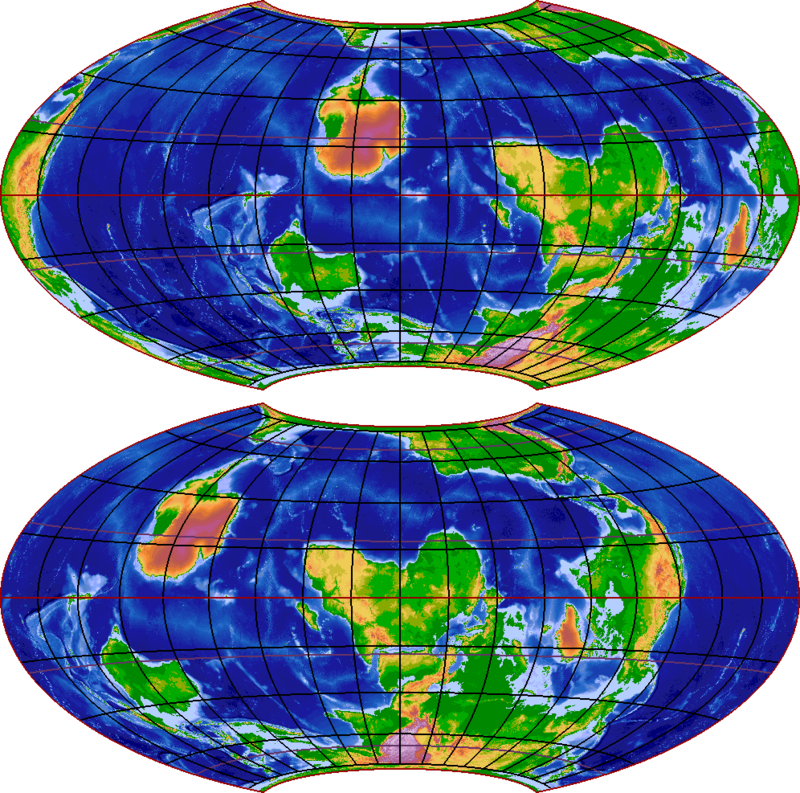 You too can create cool alternative world maps if you know a programming language and some spherical geometry. There was a bit more to it, but this is representative. This code worked well for quite some time, until we needed to move the program that it is part of to machine with a different processor architecture. When we turned on optimization in the compiler, the program stopped working. Now, an ordinary competent programmer should be able to understand that C99's strict aliasing rules authorize a compiler to assume that *a and *b refer to different objects, and therefore the optimizer may reorder the code such that the read of *b happens before *a is written. I admit it surprised me a bit that the volatile qualifiers did not prevent this, which seems to violate the letter of the C standard regarding volatile accesses and sequence points. However, apparently the compiler in question does not recognize any ordering constraints on accesses to "different" volatile-qualified objects within a basic block. However, notice that even though the compiler is not smart enough to know that the two pointers alias, it is smart enough to figure out that they can share the same register! If you think that is perfectly reasonable and understandable, you're seriously at risk of being a compiler writer at heart. For the record, I do and I am. which in this case compiled into an uncoditional call to doSomeStuff. Understanding Strict Aliasing by Mike Acton explains both the rules and the cheats that nevertheless work with admirable clarity. Respectfully recommended for your edification. Every so often – actually, every so seldom – my Zyxel Prestige 660R-61 ADSL router will enter the strangest failure mode you can imagine. Everything works except I'm unable to resolve DNS names, giving the immediate impression that the entire internet has disappeared. (I once had a smart, brilliant coworker burst into my office and announce that this was a big moment in the history of the internet: Google had gone down! Turned out that our nameserver had fallen ill, and the web addresses he had used as a control group happened to be cached locally). No, lacking DNS is not in itself strange. The strange thing is how this lack arises. See, every time I send a DNS query packet from one of the several computers behind the router, what comes back is a response packet that purports to tell be the IP address of www.kimo.com.tw. Apparently the router is not trying to falsify the address of the host I want to find. I ask about, for example, www.google.com, and back comes a packet saying (translated from RFC-1035 speak): "Thank you for your inquiry about the IP address of www.kimo.com.tw. It is my pleasure to inform you that the IP address of www.kimo.com.tw is 207.69.188.186". It's always www.kimo.com.tw. It's always 207.69.188.186. It only happens for UDP queries; DNS over TCP is unaffected. It's not the nameserver at my ISP that misbehaves; I get the same pattern when I ask a root server about "com.". I don't know whether the router rewrites my outgoing requests to be about www.kimo.com.tw, or responds with a stock reply on its own, or rewrites incoming answers. I don't know whether it affects UDP packets not to/from port 53. This has happened two or three times over a period of several years. It seems to tend to follow downtime on the ADSL connection. But whenever it happens, rebooting my local router clears the problem. It's very strange. Is the router getting infected with some malware? I have a hard time figuring out what said malware could be attempting to achieve. Because the name in the reply does not match that in the request, the resolver on my local computer will just fail instead of return a wrong answer to the application. After intensive web searching the best I have been able to find is this page in Russian, which judging by Google's translation seems to describe exactly this syndrome. Apparently it is claimed that no malware is involved, but I cannot make sense of the machine-translated explanation of what actually happens. ... a particle of spin 1 is like an arrow: it looks different from different directions. Only if one turns it round a complete revolution (360 degrees) does the particle look the same. A particle of spin 2 is like a double-headed arrow: it look the same if one turns it round half a revolution (180 degrees)... there are particles that do not look the same if one turns them through just one revolution: you have to turn them through two complete revolutions! Such particles are said to have spin ½.
I tried in vain to imagine which kind of geometrical shape would have to be turned around twice in order to look the same. And if such a shape could exist, would it stop here? Are there particles that have to be turned three or four times in order to look the same? Or perhaps two-and-a-half? I decided that someday I would find a book with actual formulas in it and try if I could understand what was actually going on here. Almost 20 years later, I'm still making progress. I bought The Feynman Lectures on Physics and worked my way through them. That enabled me to figure out what Hawking tried to say: It is not about how the particle "looks" from different directions, but about how your mathematical description of a particle such as an electron changes whan you express it with respect to coordinate systems that point in different directions. If you turn the coordinate system through 360° (which might be thought of as rotating the electron 360° in the other direction, although I'm not sure that it is helpful to try to imagine rotating a point particle), and make sure that all parts of the mathematical description vary continuously, you end up in with certain numbers in the mathematical model being exactly what they started as, but multiplied by -1. These negations happen to cancel each other out when you use the model to find out how the electron behaves, which is good: The particle ought not to behave any differently because you've walked around it. So I'd say that the election "looks" the same after a single revolution, but we speak of it in a slightly different way. It's as if it was a glass that started out half full, and after we turn it through 360° it appears to be half empty instead. So far, so good. But how about the turn-three-times (spin 1/3) or turn-two-and-a-half-times (spin 0.4) varieties I'd hypothesized? More reading had to be done. Presently I got to the point where mathematical gibberish such as "spin is a two-state quantum property where the amplitudes transform under SU(2)" appear to make sense to me. The two-revolutions rule is because SU(2) is a double cover of SO(3) which is the group of rotations in three-dimensional space. But why does the electron choose to transform under SU(2) – say, could it have picked a different group which is a triple cover of SO(3), leading to a three-revolutions rule instead? Recently I figured out how to think of this such that it is clear that SU(2) is special. I'm rather pleased about this, because I've had to invent it myself – none of the textbook I've consulted explain it. (It would be ridiculous to pretend that I'm the first to invent it; these is recreational musings, not serious research). The first thing to note is that even though SO(3) is often described as the groups of rotations in space, this is a bit misleading. It would be better so say that it is the group of instantaneous rotations in space. If you use an element of SO(3) to specify how to rotate a body in space, what you really get is a mapping that tells how to get from the old position of any point in the body to the its new position, but says nothing about how it got there. Yet, in everyday language "rotation" denotes the process of rotating something, rather than the end result. If you take a tangible object such as a book and rotate it, we speak of a process that takes place over time, and during that time the book occupies various intermediate positions, which change smoothly during the roation. Just pointing to the element of SO(3) that describes the book's final state ignores all that. For example, you can place the book front side up on a table and flip it to the back side either turning it around the left edge or around the right edge. The book ends up in precisely the same position, yet the two ways of flipping are quantitatively different. You can't construct a continuously varying family of ways-to-flip which contains right-flipping as well as left-flipping and all end up in the same orientation. Try it! What should come right in the middle between left and right? We could turn the book around the bottom edge, towards ourselves, but then the flipped book ends up upside down, and we have to decide whether to turn it clockwise or counterclockwise in order to reach the specified ending position. The idea of a continuously varying family of continuous rotation processes turns out (ha!) to be key. Let's try to make this a bit more formal and general. Warning: higher mathematics up ahead! Start with a topological group G, i.e., a group which is also a topological space and where the law of composition is continuous. The main example to think of is G=SO(3), but most of what we'll do does not depend on the deep inner structure of SO(3) in particular. Define an auxiliary group A whose elements are continuous maps a:[0,1]→G such that a(0)=1G. The law of composition on A is pointwise multiplication in G, that is, (a1*a2)(t)=a1(t)*a2(t). Clearly, A is a group. When G=SO(3), an element of A represents a particular continous rotation process. The composition in A is algebraically easy but has no intuitive geometrical interpretation. Let T consist of all elements a of A for which there exists a continuous map α:[0,1]×[0,1]→G such that α(t,0)=a(t) and α(0,u)=α(t,1)=α(1,u)=1G for all t and u. It is easy to see that T is a normal subgroup of A. There is a continuous homomorphism from Gspun to G, since T lies in the kernel of the "end-state" homomorphism from A to G which maps a to a(1). (The kernel of Gspun→G is the "fundamental group" for the topological structure of G). For a∈A, choose any continuous f: [0,1]→[0,1] such that f(0)=0 and f(1)=1. Then a and a◦f represent the same element of Gspun. For any a, b∈A, define (a;b)(t) to be b(2t) for t≤1/2 and a(2t-1)*b(1) for t≥1/2. Then a*b and a;b represent the same element of Gspun. Thus in Gspun the group operation does have a geometrical interpretation: it corresponds to the process of first doing one continuous rotation and then another one. Now back to physics, fixing G=SO(3). Imagine that we have a mathematical model of some physical system and a recipe that says how to change the model when we rotate the system in a gradual, physically plausible, continuous way. Such a rotation corresponds to an element of A, so the recipe really maps A into the space of changes to the model. Now we may want to consider only recipes that do not distinguish between rotation processes that can be varied continuously into each other. If so, the recipe must be a homomorphism from Gspun to the space of changes to the model. And for G=SO(3), it turns out by pure accident that Gspun is isomorphic to SU(2)! The books I've read tend to start by pulling SU(2) out of a hat, and then deriving that it accidentally corresponds to certain rotations. How lucky that the group the electron chose to represent happens to have a geometrical representation! I find it much more compelling to think oppositely: The electron chose the most general way of responding to rotations it could, and that turned out, accidentally, to have a simple interpretation in terms of complex numbers. What is it with Cory Doctorow and hot-air balloons? Humorous references appear to be popping up in the strangest places – last in Bruce Schneier and the King of the Crabs (which I discovered through Schneier's own blog). But just what do these references actually reference? I find them mildly funny because they evoke memories of the Xkcd episode "Blogofaire", as well as the small print in "Online Communities". On the other hand, I don't get out much. For all I know, Doctorow might be famous for being an avid balloon pilot in addition to a writer, and that's what everybody are alluding to. On the other-other hand, I cannot seem to google up any non-humorous Doctorow/balloon juxtapositions. So perhaps it is all an in-joke referencing the xkcd strips, or perhaps xkcd was itself referencing some ur-joke known to only a few initiates (or, alternatively, to everybody but me). Impossible to know, really – when an Internet meme reaches a certain critical mass, half of those who pass it on have no idea what it refers to, anyway. Close to nobody ever played Zero Wing, but that does not prevent the all your X are belong to us snowclone from being productive.